Moulinath Banerjee, PhD, is Professor of Statistics, College of Literature, Science, and the Arts, at the University of Michigan, Ann Arbor. Moulinath Banerjee was born and raised in India where he completed both his Bachelors and Masters in Statistics at the Indian Statistical Institute, Kolkata. He obtained his Ph.D. from the Statistics department at University of Washington, Seattle, in December 2000, served as lecturer there for Winter and Spring quarters, 2001, and joined University of Michigan in Fall 2001. 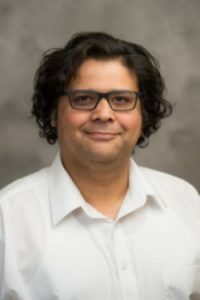 Mouli’s research interests are in the fields of non-standard asymptotics, empirical process theory, threshold and boundary estimation, and graphical networks. His main contributions to date are in the areas of inference under shape-restrictions, especially monotone functions, and inference in the setting of designed multistage procedures. Mouli is the recipient of the 2011 IISA Young Investigators Award and an elected fellow of ISI. He has a broad range of interests outside of statistics which include classical music, literature, history, philosophy, physics and ancestral genetics. He is, also, most emphatically, a gourmet and believes that a life without good food is a life less lived.